Photo: photo division/Radius Images/Getty Images. Heading south this winter? Taking a bucket list trip? Travelling for the holidays? “Travelling involves realities such as congested airports, airborne germs on planes, trains and buses, and changes in temperature, food and routine — all of which can play havoc with one’s health,” Billy Cheung, Executive Director, Pharmacy & Professional Affairs of Pharmasave Ontario says. According to the World Health Organization (WHO), the most common health problems associated with travel to developing countries, in particular are diarrhea, malaria, acute respiratory tract infections and influenza. Those could take the wind out of just about anyone’s wanderlust. Before your next trip, Cheung has the following tips for prevention and preparedness. 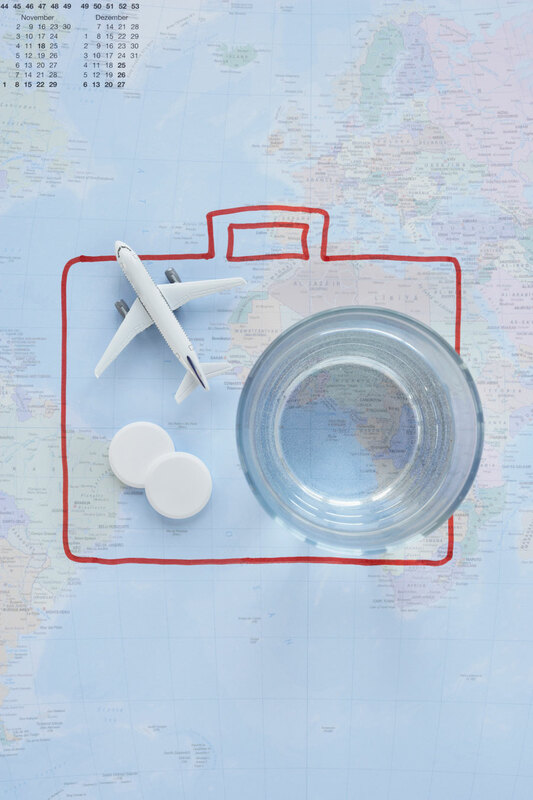 Check the Centers for Disease Control and Prevention (CDC) for a list of destination-specific vaccines and medications to prevent illnesses such as yellow fever, malaria or elevation sickness, for example. Also, try CANImmunize, a free app with which you can store your (or your entire family’s) immunization records, and access information on vaccines specific for kids, adults and travellers. Taking along the following may mean investing in a toiletry kit that’s a little more robust but surely our health is worth the extra space — and a checked baggage fee. Cheung’s top picks are pain and fever medication, cold or sinus caplets, anti-diarrhea pills, oral rehydration salts for managing fluid loss due to diarrhea or vomiting, antihistamines to treat potential allergic reactions to food or insect bites, decongestants (making sure there are no contraindications), antifungal cream, and hydrocortisone cream for irritated or itchy skin. Items that may help prevent nausea and vomiting caused by motion sickness include a Scopolamine patch, Gravol, ginger root, and wrist bands that exert pressure and stimulate the P6 acupressure point. To decrease the potential of sickness while in motion, Cheung also suggests focusing on the horizon, practicing mindful breathing, and avoiding reading and screen time. Keep hand sanitizer and anti-bacterial wipes readily accessible in a carry-on or day bag for regular use throughout your trip. The CDC, Environmental Protection Agency and WHO all recommend DEET-based products for best defense against insect and mosquito-transmitted diseases, such as Zika and West Nile virus. Studies show that formulas containing at least 30 per cent DEET are most effective. With studies showing a higher risk of death related to deep venous thrombosis (DVT) and pulmonary embolism (PE) on flights longer than eight hours, Cheung recommends investing in a pair of compression stockings. Also, an aisle seat makes it easier to get up and move around the cabin regularly during flights. And, do calf muscle exercises every hour or so. If you’re at increased risk — due to cancer, recent surgery, advanced age, obesity or pregnancy, for example — consult with your doctor who may consider prescription medication. Travel with a list of your medications, including your dosage and reason for taking them. Schedule an appointment with your pharmacist for a medication review. To keep your medication routine on track, use a pill organizer and set daily reminders on your phone. Be mindful of time changes in order to dose at the proper intervals — particularly for time-sensitive medications such as oral contraceptives and insulin. Bring extra medication to cover unexpected trip extensions. Pack a thermometer, bandages, blister and wound care, tweezers and an antiseptic, after-bite cream. And in addition to sunscreen (with at least 30 SPF and both UVA and UVB protection) also pack after-burn care. To download a Travel Health Checklist, visit www.pharmasave.com.